The Merdeka PNB 118 development was recently launched by Malaysian Prime Minister Datuk Seri Najib Tun Razak, paving the way for a striking new icon on Kuala Lumpur’s skyline. The 118-storey high tower and shopping mall, by Permodalan Nasional Berhad, will create an arresting landmark for the city. The Buchan Group provided architectural and interior design services for the retail podium of the development which embraces its unique setting and is legible as a destination in its own right. 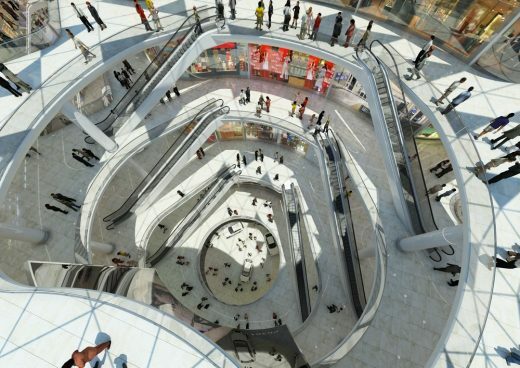 Incorporating a diverse range of experiences over seven levels, the centre will provide an internally inspired retail destination offering a wide spectrum of retail, luxury brands, fashion, accessories, home wares, electronics, dining and entertainment. Project Principal, Andrew Mackenzie, was honoured to attend the launch ceremony for the development. “I am thrilled to have been present for the launch of this exciting project and we are very proud to have been involved in the design of the retail podium,” said Andrew. A sound and clear retail strategy is critical to the success of the mall and is characterised by a retail diagram consisting of well-located anchor units and appropriately spaced activities. This is reinforced by clear active routing between the anchors along with the use of filtered natural light, lofty public spaces and framed views capturing crisp, clean and modern architecture. Located alongside Stadium Merdeka and Stadium Negara, a new MRT station and the Merdeka PNB 118 tower, the retail precinct will provide the perfect vantage point for visitors to relax, dine and be entertained. The development is expected to be completed by 2024. With 125 years of design excellence, The Buchan Group has a vast global reach extending across offices in the United Kingdom, China, the Middle East, Australia and New Zealand. With almost 400 professionals, the firm is recognised for its design excellence and depth of experience in retail, residential, hotels, mixed use, leisure and commercial developments. The Group’s projects include: Wuhan 1818 (Wuhan, China), Sheraton Melbourne (Australia), Emporium Melbourne (Australia), Cloisters on Hay (Perth, Australia), Christchurch Art Gallery (New Zealand), Westfield London and Westfield Stratford City (United Kingdom), Chadstone Shopping Centre (Melbourne, Australia), DiverCity Tokyo Plaza (Japan), The Emerald (Melbourne, Australia) and Raffles City Chengdu (Chengdu, China).